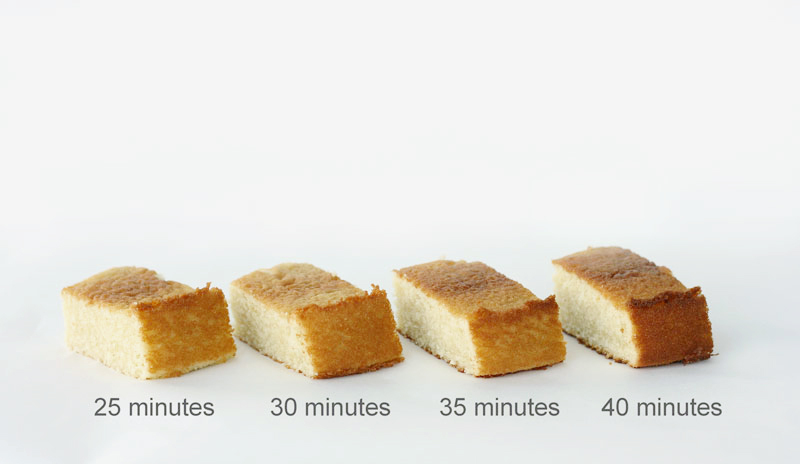 Baked to Perfection – how baking time affects cake moisture and structure. Do not over bake! This warning is often found in the instruction section of a cake recipe. But being the skeptic that I am when it comes to conventional baking wisdom, I wanted to know if you could really damage a cake by letting it spend a few extra minutes in the oven. I decided to put this admonishment to the test practically and scientifically to determine how narrow the window of baking perfection was. Before we get into the details of the experiment let’s talk about what happens when a cake bakes. Cake baking is a complex symphony of processes that take place in sequential and overlapping stages. Three major phases define cake baking. In order for expansion, setting and browning to come about a number of chemical reactions must happen. The following is a list of the sequence of the reactions in cake baking and the phase they set into motion. Although it doesn’t appear that there is much going on early in cake baking, there are actually a number of critical steps happening. Melting fats and dissolved sugars coat starches and proteins which is critical for tenderizing and aiding moisture. 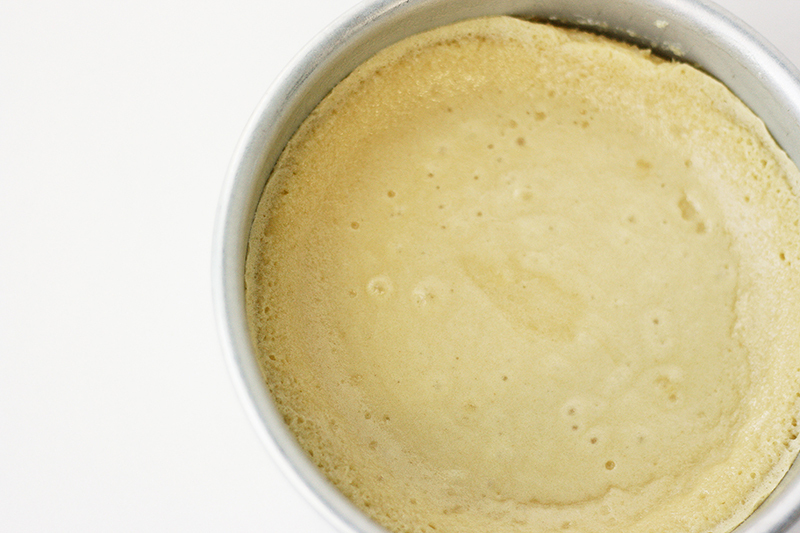 Air bubbles beaten into the cake batter expand with the help of leavening agents. And, proteins begin to unfold which will be essential for later coagulation and structure building. In the setting phase, events transpire rather quickly and a cake can go from gooey batter to fluffy cake in no time. The previously unfolded proteins link together forming a firm scaffolding while starches take on fluid and puff up to fill in the spaces of the protein network. At this point the cake is solid and a toothpick test will show little or no crumbs or batter when inserted into a cake’s center. The final phase of baking, browning, can only happen when water is evaporated off of the surface of the crust, allowing the outer temperatures to reach at least 250ᵒ F. As surface temperatures increase, Maillard reactions take place while caramelization ensues. Both Maillard reactions and caramelization lead to surface cake browning. 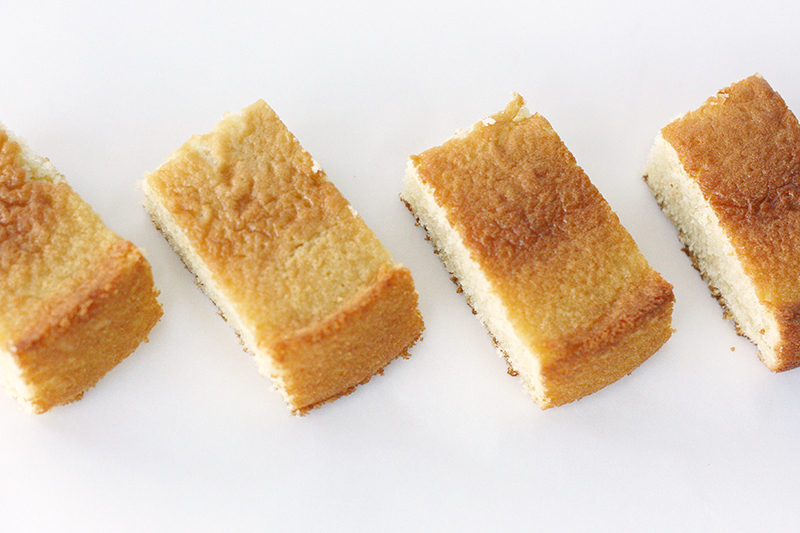 To find the sweet spot for cake removal, I baked six cakes and removed them in five minute intervals from the oven. I started removal 15 minutes after I placed the cakes in the oven and removed the last cake at 40 minutes. I tested each of the cakes with a toothpick and took an internal temperature reading to find out what was going on inside. The slowness of the initial baking mechanisms is clearly seen in the first couple of cakes (removed at 15 and 20 minutes). While some setting was beginning to occur at the edges of the cake, the centers of the cakes were wet and quite liquid. This liquefaction indicates that fat melting, sugar dissolving and protein unraveling were well underway but that the setting processes were yet to be completed. Since setting of the cake begins at 180ᵒ F, it is clear by the temperatures of 165ᵒ F and 185ᵒ F respectively, the cakes had not reached a temperature high enough to complete the setting phase. Just five minutes later, the puzzle pieces had fallen into place and the cake had completed its structural progressions. The proteins had cross-linked with neighbor proteins, the starches had swollen to fill in gaps created as gasses had previously expanded and the surface of the cake had dried enough for the crust temperatures to rise and begin the browning methods. 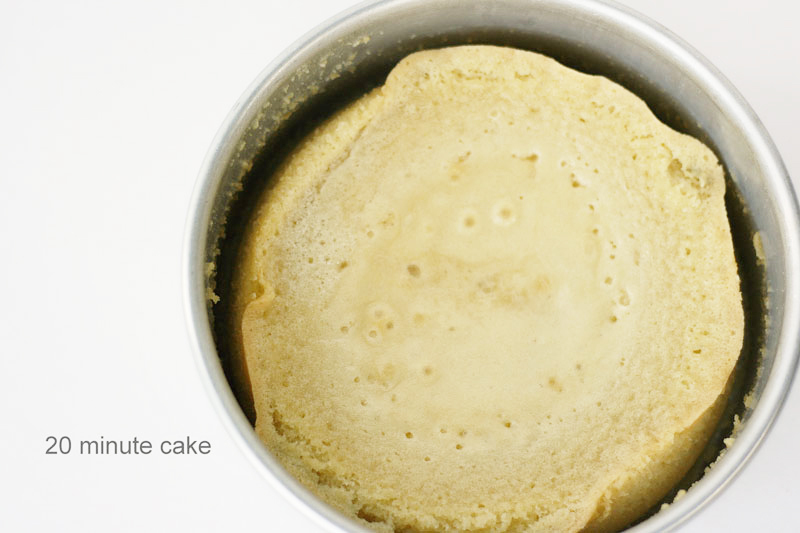 Since water boils at 212ᵒ F, the highest internal temperature a moist food can reach is 212ᵒ F. The cake removed at 25 minutes was 205ᵒ F, still well below the temperature where water vaporizes. This means that the cake removed at 25 minutes still contained significant moisture. By 30 minutes of baking time, the cake had reached 212ᵒ F. This suggests that the cake was not only losing moisture on the surface of the cake (indicated by increased browning) but also internally since it had reached the temperature of water vaporization. The fact the subsequent cakes showed a drop in internal temperature (211ᵒ and 208ᵒ) indicates that a change in composition had occurred and it was no longer operating as a “moist” environment because of water losses. The loss of moisture was also apparent when the cakes were tasted. 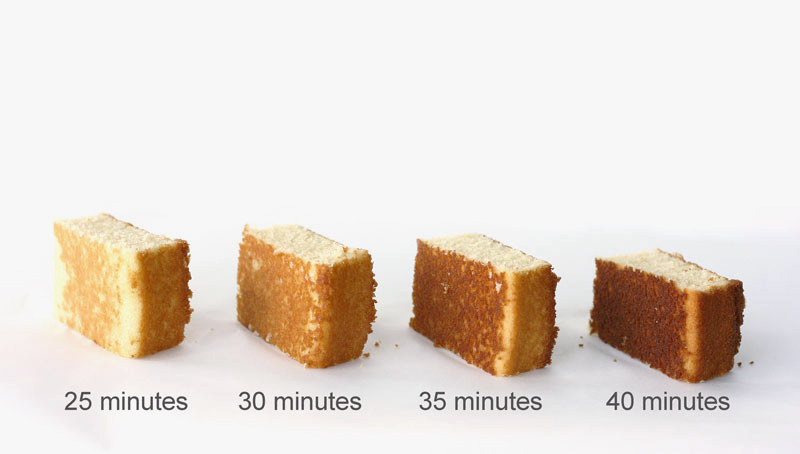 The 25 minute cake was moist, while the cakes with later removal times were clearly drier. The cake removed at 40 minutes had a drier interior but also a noticeably dry, tough, thick outer crust. The excessive browning found on the 40 minute cake also gave it a slightly bitter flavor indicative of overcooked foods. Is it important to remove a cake from the oven close to its setting time? I would have to say, yes. This experiment showed me that a mere 5 minutes in the oven can noticeably change the character of a cake. Removing the cake too soon will leave you with an unstable structure that will likely fall or sink in the middle. Once the cake is set, evaporation of precious moisture follows suit quite rapidly. So keep a close watch on your baking times and closely monitor your cake for indications of doneness. Because oven temperatures can vary (read more about oven temps here), it’s best to start checking your cake a few minutes before the bake time listed in the recipe, following up every couple of minutes. This may be the key to baking beautifully moist cakes. Is Your Oven Accurate? And Why It Matters! I love all of your scientific explanations. I always tell me people baking is science not cooking! I am wondering if you would ever do a post on how to convert a recipe to mini cupcakes? I know that you had mentioned before that there are lots of factors when changing the size. Have you ever done any experiments with gas ovens vs electric. I am having such a hard time with my new gas oven. I know temperature has a lot to do with it and I bought an oven thermometer. But cakes still don’t seem to bake as well as before, the outside is brown and the inside not cooked. What causes a layer cake to shrink in at the middle on the sides? Would it be wiser then to take an instant read thermometer and take the temperature of the middle of the cake as an indication of doneness? I have used the “spring back” method and the “toothpick” method and sometimes still have my cake fall in the center or turn out drier than I want. If the “done” temp is 205 deg, it seems like that is a surer method of testing. How long do you let your cakes cool in the pans before turning them out? Great post! 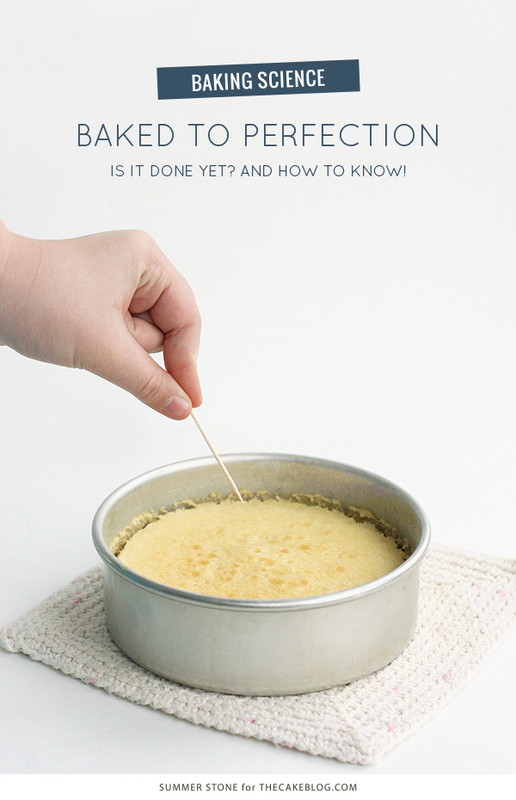 On my blog, Bakes and Blunders (www.bakesandblunders.com), I try to explain the reasons/ science behind a recipe’s instructions. I certainly don’t manage to be quite as scientific as this post though. Thanks for the information!